Just get a Christmas Cactus and wondering what you do with it now? 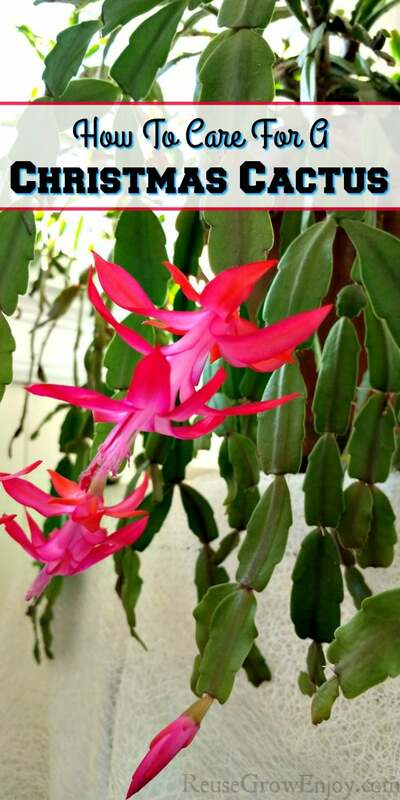 I am going to share a few tips on how to care for a Christmas Cactus plant. They really are pretty easy to care for! 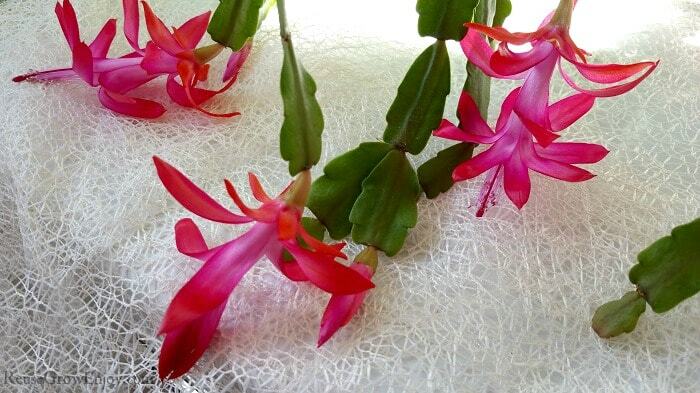 Many people like to give a Christmas Cactus as a gift. 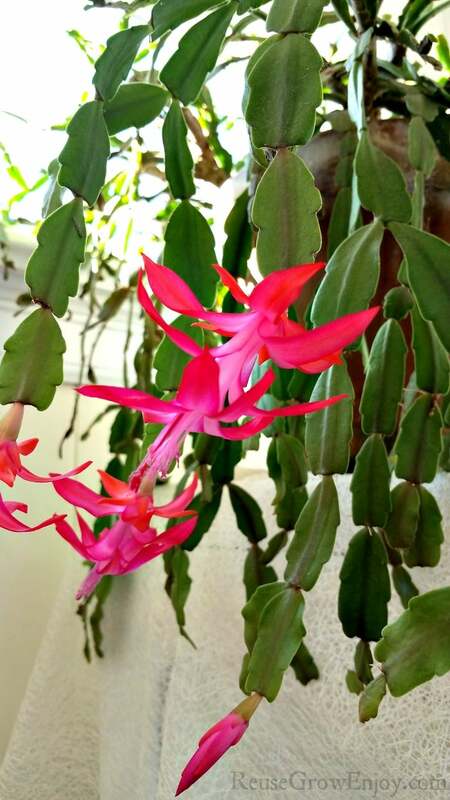 Whether you have been given one or just bought one for yourself, I am sure you will find these tips on how to care for a Christmas Cactus plant very helpful. First, let’s start with a few details about the Christmas Cactus. You may know it from its other names Schlumbergera or Zygocactus. There are different types of this plant and normally the name comes from the time of the season that it flowers. So with this one being called a Christmas Cactus, you will find that it normally flowers around late December. However, it can vary slightly and even from year to year. The plant is made from leaf-like pads that connect to each other. They are more like a steam for the plant than a leaf. It will keep growing new pads from the end of the last one. It will also flower from the ends of the last pad. But that can also sometimes grow from the joints of the pads too. They come in a variety of colors such as red, pink, white or orange. If you want even more background on the Christmas Cactus, you can find more info on Wikipedia. You want to pick a pot that has a hole in the bottom to allow for draining. Your soil should also be a well-draining soil. It is best to use a mixture of potting soil and sand. Or you can also buy a pre-mixed soil for cactus. It needs to be able to hold some moisture so that the plant can get water but drain off any extra so that the roots are not wet all the time. Unlike a cactus that you find in the desert, this type requires a little more water to live. Depending on the season, will depend on how much water to give it. If in the hot summer months, you need to give it a good heavy watering about once a week. If it is an abnormally hot and dry summer, you may need to bump this up to about every three-five days. In the cooler months, you do not have to water as often. You can cut back the watering to about every week and a half. When you water, you want to make sure it is a good watering and not just moist the top of the soil. 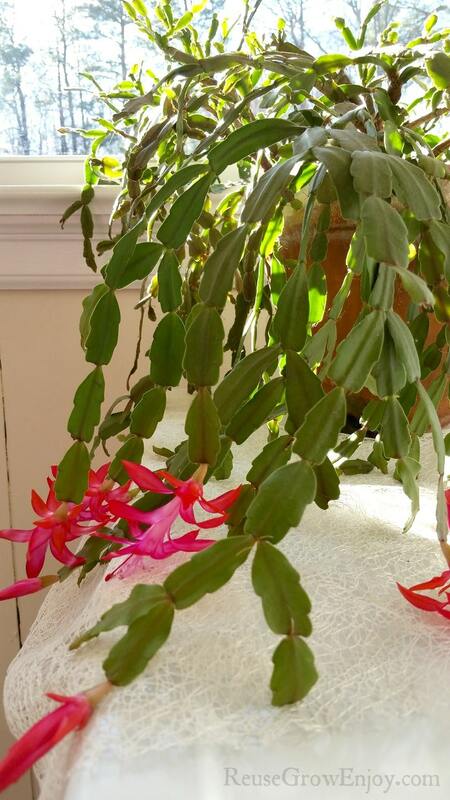 Christmas Cactus likes bright but indirect light. You can place near a bright window but not right in it. If the window is really bright and gets lots of sun all day, diffuse it with a sheer curtain. In the summer, I like to put mine on my covered porch. That way it gets lots of indirect light but does not get burned. If you put a Christmas Cactus in direct sunlight it will burn the pads of the plant. If you do not have good lighting or very little light in the winter, grow lights work really well. When I bring mine in for the winter, I use a LED grow light and my plant loves it. When learning how to care for a Christmas Cactus plant, one of the best things to know is temperature. They love warm humid environments. However, when it is about the time for them to bloom, they do well to have a little temperature drop. You just want to make sure you never allow them to be in freezing temperatures as it will kill the plant. Keeping them indoors at 65 – 80 degrees works well for most of the season. Or even outside like I said before in the summer when the temps are around that. If you are in a super dry area, you can place a dish or water under the pot or even just beside it. That way as it evaporates, it will make humidity around the plant. When it comes to fall and winter time and flowering season, put the plants in a room that dips down into the 50 and 55. Allow it to stay in those temps for about a month or until you see flower buds starting to form. Then you can move it back to normal room temperatures. This helps to force the flowering of the plant. Fertilizing the plant is not something you have to do all the time. However, to keep your plant in its best health, it is good to feed it a few times a year. When fertilizing a Christmas Cactus plant, it is a good idea to use a blooming houseplant fertilizer or a fertilizer that is for cactuses. They normally say to feed about one time per month, but I have found that the really only need it about one time every 4 months. Make sure you time your feedings so they stop at least a month before blooming season. If you want to encourage new growth on your plant you can do a little pruning. This helps to encourage it to bush out more. It can also be done if your plant is just simply too large and you want to downsize it. The best time to trim your cactus is after the flowers are dying off. After the blooms are dying off you have about a two-month window to do your trimming. After that, you will run into the risk of harming your plant. To prune all you need to do is twist it off at the joint of the pads where you want to trim. If you have a thick or tough plant, you can snip with a pair of pruning shears. There is one thing to note when trimming, you want to be sure not to trim too much. If you are pruning to promote the plant to bush out, you only need to trim a little piece off a few ends. When pruning to trim it down because it is too big, just be sure to never trim more than one-third of the plant per year. If you will be growing more plants from the cuttings, try trim pieces that are a Y shape or that at least have a few joint sections to them. One of the best things about learning hot to care for a Christmas Cactus is to find out you can grow more just from cuttings! These plants really are one of the easiest plants to grow from cuttings. You will have a house full of new plants in no time. They also make great gifts. To propagate a Christmas Cactus, you want to start with a Y shape-cutting or one that has at least a few pads to it. After you have trimmed your cactus, let the trimmed off pieces dry out a little. Shoot for a minimum of at least four hours to dry and as much as up to 2 days. This helps to dry up the end of the cutting. Get some small pots around 3 to 4-inch pots work well. Fill them with a well-draining soil just like you did for the adult plant. Moisten the soil but do not make it saturated with water. Now push the pads about halfway down (the end that was cut from the other plant) into the soil. You want it to be about 3/4 to an inch deep in the soil. Then set it in some indirect light in a cooler room and treat just as you would an adult plant. After about six weeks you should start to see some new growth if everything went well. You can leave it in the small pot for a while if you want or after it the new growth is really noticeable, you can repot into a larger pot if you want. Looking for tips on how to care for other houseplants? Here are a few to check out.